To Cite: Majidi S A, Nasiripour A A. Performance Improvement Priorities From the Perspective of Emergency Department Staff in Iran’s Hospitals, Crit Care Nurs J. 2016 ; 9(4):e8050. doi: 10.17795/ccn-8050. Background: The emergency department is the heart of every hospital and regular circulation of tasks in this unit can save countless lives. Quality of services provided at emergency departments is of particular importance and performance improvement is considered as one of the most important processes in emergency departments. Objectives: The aim of this study was to determine performance improvement priorities of emergency departments of Iran’s hospitals. Methods: This research was a cross-sectional study. First, a systematic review was conducted and performance improvement priorities of the emergency department were identified and designed as a questionnaire in five areas: communication, teamwork, clinical pathway, patient flow and other factors. During October 2015, after examining the content validity index (CVI) and content validity ratio (CVR), the questionnaires were given to 200 hospital emergency experts (doctors and nurses) across the country. After collecting the questionnaires, the data were entered into the SPSS software and analyzed. Results: In a comparative investigation of the scores of different areas of performance improvement of emergency department of the country’s hospitals based on Friedman test, from the perspective of the emergency department staff, the average score of these areas was significant (P < 0.0001). 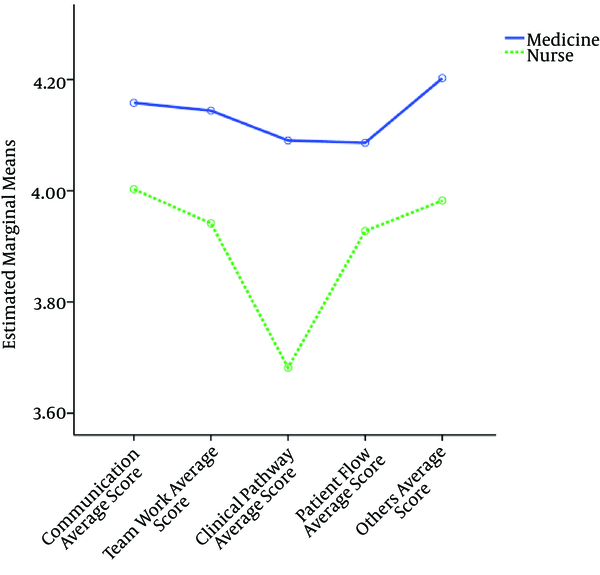 Correlation of communication area scores with four other areas was statistically significant, and the communication area had the highest correlation with the teamwork area (P < 0.0001 and r = 0.821). There was a significant difference between the scores of different areas and performance improvement in female (P < 0.0001) and male groups (P < 0.009). The doctors’ opinions were similar in all areas and there was no significant difference (P < 5%). However, nurses had different opinions on performance improvement priorities of the emergency department. Conclusions: Priorities set by emergency workers in various areas such as communication, teamwork, clinical pathway and patient flow, play a significant role in the performance improvement of the emergency department. Emergency department is the heart of every hospital and regular circulation of tasks in this unit can save countless lives. This department has sensitive and exceptional position in the hospital and health care system because of the need for rapid, high-quality and effective conduction of multiple and complex processes (1). The most extensive and vital emergency services are provided at this department. This ward, as the entry for emergency patients and interconnection with other parts providing emergency services, provides a wide range of services from admission and initial assessment for quality determination to discharge of patients (2). Quality of services provided in emergency departments is important. However, special features of emergency department such as diversity, plurality of references and high-volume work, clients’ expectations of receiving services as soon as possible, diversity of problems and complexity of the emergency services, can all affect the performance of this departments (3). Since the largest and the most serious referral of the patients are to the emergency department, how to provide the services in this ward indicates the general state of providing services in the hospital. Dissatisfaction of patients at the emergency department due to factors such as high waiting time, lack of necessary quality in service delivery and release from the hospital without receiving proper treatment in turn, can lead to increased mortality (4). Therefore, none of the care aspects of emergency department is as important as the ability of emergency department to assess, treat and determine patients’ conditions in a reasonable time frame, according to the facilities and manpower of the department (5). The imbalance between supply and increased demand leads to overcrowding of patients in hospitals. In the emergency department, patients’ treatment should be fast, convenient and with high quality. The results of congestion can be lack of patient admission, disorder in the performance of emergency department staff, decreased quality of services provided, increased stress, decreased employee morale, reduced service quality, reduced efficiency and inappropriate effects on the performance of this ward (6). The hospital emergency department is an important part of the hospital and its function may have great effects on the performance of other wards of the hospital and the satisfaction of patients. Emergency department performance includes admission, triage, stabilization and stating treatment of patients referred to the department with different signs and symptoms (7). Undoubtedly, the biggest problem with most emergency wards is overcrowding of patients at the emergency ward. This congestion can be seen in several forms such as excessive number of patients at the emergency ward, examination of patients in the corridor section of the ward, increased waiting time, patient leaving the emergency ward without receiving service, and not accepting patients brought by ambulance due to insufficient capacity. There are several indicators to review the performance of the emergency ward, for example, the length of stay for patients at the emergency ward, wait times, and not accepting the patient due to bed shortage (8). Emergency Department Performance Improvement is defined as a multi-field and programmed organizational performance, which analyzes performance improvement methods in order to recognize a systematic approach to improve and maintain the department performance by prioritizing, designing, implementing and monitoring. Emergency Department Performance Improvement must constantly be evaluated and, if necessary, revised (9). The need for improvement of the emergency departments is greatly accepted due to the care costs, speed of service delivery, crowd and patient’s safety, and with increase in demand for emergency care, hospital managers are seeking new ways to provide more effective health care services (10). Measurement and continuous monitoring are needed to ensure optimal performance of emergency department services and achievement of improvements in every aspect of performance. In this regard, emergency department performance improvement was considered as a fundamental approach that can be the basis for providing high standard of care at the department (11). In the recent years, emergency department performance improvement was considered as an important goal in health policy in different countries; this objective is seriously acted upon by staff and management of the emergency department (12). Therefore, in this research, attempts were made to identify performance improvement priorities of emergency departments in Iran’s hospitals so that, high quality services can be provided to patients referred to the department as soon as possible and thus the possible complications can be prevented. This study aimed to set performance improvement priorities from the perspective of emergency department staff of Iran’s hospitals. A systematic review was conducted in order to achieve the above objective, and the most important medical databases relevant to the research including Scopus, PubMed and Cochrane library, were searched from January 2000 until July 2015 to find articles related to three advanced searching strategies using Mesh and Freetext. According to the conducted research, emergency department performance improvement priorities were classified into five areas: teamwork, communication, patient flow, clinical pathway and other factors. Priorities obtained from a systematic review in five areas were designed as two questionnaires consisting of 34 factors in the form of 126 questions and, to determine the content validity, the questionnaire was given to ten experts in the field of hospital emergency and faculty of Guilan University of Medical Sciences (five experts in emergency medicine and five nursing masters) with history of clinical and research work in the field of emergency. The above questionnaire was designed in two forms: a) to determine the content validity index (CVI) and, b) to determine the content validity ratio (CVR). After reviewing the CVI and CVR, the final questionnaire was designed. In this questionnaire, the impact of each of these terms was arranged in a five-point Likert scale; very low, low, medium, high and very high. The questionnaires were given to 200 hospital emergency experts, including doctors and nurses across the country. The sampling method in this step was two-stage cluster. For this purpose, firstly, the list of provinces, emergency departments and the staff were identified, and then due to the large number of staff working at emergency departments across the country, 200 people were selected at random among provinces across the country. After gathering the questionnaires, information were entered into SPSS Version 20 software and analyzed. To determine internal consistency of the questions, Cronbach’s alpha coefficient was used. Cronbach's alpha coefficient indicates internal validity of the questions in measuring the performance improvement priority of the emergency department for separate areas. Cronbach's alpha for all areas was higher than 0.7. In comparative investigation of the scores of different areas of performance improvement of emergency department of the country’s hospitals based on Friedman Test, from the perspective of emergency department staff, the average score of these areas was significant (P < 0.0001), and in the assessment of performance improvement priorities from employees’ perspective, the area of communication with mean and standard deviation of 4.02 ± 0.6 was known as the first field and the area of clinical pathway with mean and standard deviation of 3.72 ± 0.72 was known as the last (Figure 1). 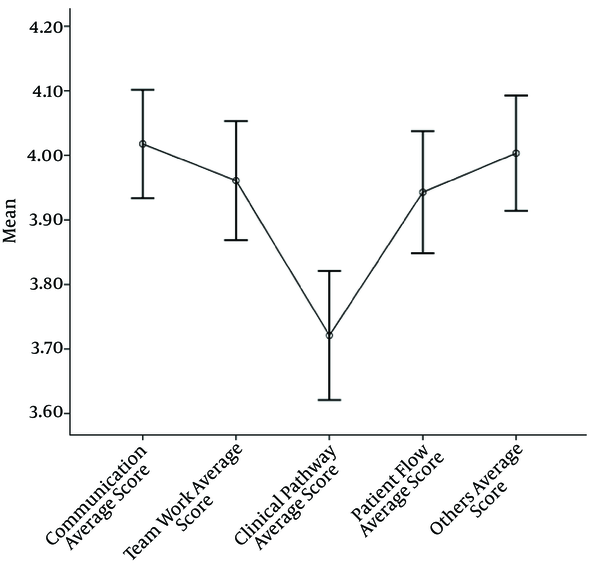 In investigation of Spearman’s correlation index, the scores of different areas of emergency department performance improvement, correlation of communications domain with four other areas was statistically significant, and the communication area had the highest correlation with the teamwork area (P < 0.0001 and r = 0.821). 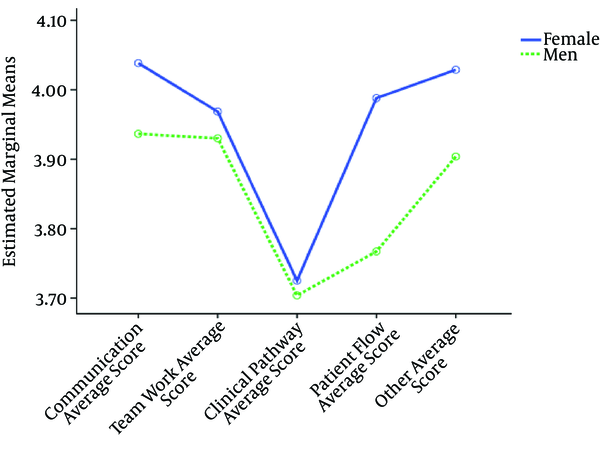 Correlation analysis of teamwork area showed that this area also had a significant positive correlation with other studied areas, while the teamwork area after communication area had the highest correlation with patient flow area (P < 0.0001 and r = 0.731). Correlation analysis of area scores of clinical pathway matrix (Table 1) shows that the highest correlation of the area was with patient flow scores (P < 0.0001 and r = 0.703) and also other areas (P < 0.0001 and r = 0.703). Correlation analysis of patient flow area scores showed that this area had the highest relationship with the area of other factors (P < 0.0001 and r = 0.784) (Table 1). In comparative analysis of comments of male and female employees at the emergency department on the performance improvement priorities, according to Friedman test results, there was a significant difference in the scores of different areas and performance improvements in female (P < 0.0001) and male groups (P < 0.009). Also, among the views of male and female employees working at the emergency department, regarding the individual areas based on the Mann-Whitney test (P < % 5), no significant difference was observed (Table 2 and Figure 2). In review of emergency department staff attitudes in terms of occupational class of doctors and nurses towards performance improvement priorities based on Friedman test results, doctors’ comments were similar in all areas and there was no significant difference (P < 5%). However, in assessing nurses' attitudes towards emergency department performance improvement priorities, there were different views (Figure 3), thus, communication area priorities were the strongest, and clinical path area was the weakest priority (P < 0.0001). In comparative investigation of scores in each of these areas based on the Mann-Whitney test (Table 2), in the area of clinical path, there was a significant difference between doctors and nurses’ comments in the field of performance improvement priorities (P < 0.02). In prioritizing the terms of communication area, two terms: sufficient knowledge on the physical environment of the emergency department by staff with mean and standard deviation of 4.29 ± 0.8 and fatigue, distraction and misinterpretation of symptoms and communication signs between employees with mean and standard deviation of 4.24 ± 0.8, were respectively considered as the most important terms of communication area between five achievable scores. In the area of teamwork, three terms: strong incentive for teamwork among employees (4.22 ± 0.82) and sufficient number of emergency staff to carry out teamwork (4.18 ± 1.12), were respectively, considered as the most important terms of teamwork area between five achievable scores. In prioritizing the terms of clinical pathways, three terms, reducing the time interval between arrival, admission and transfer of patient (4.17 ± 0.82) and the proper conduction of triage and deciding on the admission and treatment of patients (4.16 ± 0.92), were respectively considered as the most important factors in clinical pathways area between five achievable scores. In prioritizing the terms of patient flow, three terms, an appropriate place for relaxation of personnel with long-term serving (4.23 ± 0.97) and using experienced and trained staff (4.15 ± 1.12), were respectively considered as the most important terms of patient flow area between five achievable scores. Finally, in the area of other emergency department performance improvement priorities, three terms: the trust and confidence of the patient on the emergency department staff (4.27 ± 0.84) and the faster transfer of patients to other wards (4.25 ± 0.96), were respectively considered as the most important terms of other emergency department priorities between five achievable scores. The findings of this study to investigate performance improvement priorities, from the perspective of employees in the five assessed areas, showed that communication is the most important area among other areas; this finding indicates special importance of factors associated with this area in emergency department performance improvement. According to Kilner and Sheppard (2010) (13), the emergency department was known as a unique environment and due to high number of referrals; it requires proper planning for performance improvement of employees. O'Leary et al. (2010) (14) also found that proper communication between emergency workers, including doctors and nurses, to provide safe and effective patient care, is very important. Zajano et al. (2014) (15) reported that strong incentives for proper communication and cooperation in fulfilling tasks, is one of the most important priorities for emergency department performance. Investigation of the correlation between different areas of emergency department performance improvement showed that the relationship between these areas is significant. According to Kilner and Sheppard (2010) (13), the role of communication and teamwork on improving patient and staff satisfaction, reducing clinical errors and improving patient safety is considered important. Hwang and Ahn (2015) (16) found that role of teamwork and communication components in improving health outcomes of emergency department is important and due to population growth and increased demand for services, creation of changes in teamwork education process and good communication should be considered, especially in new staff. Boudreaux et al. (2006) (17) also reported that performance improvement methods often depend on changes in the care process, patient flow, clinical pathways, communications or management team structure rather than increase of the facilities and staff. Therefore, different areas of performance improvement are connected with each other and performance improvement of emergency department is the outcome of interacting components of these areas. In comparative investigation of opinions of male and female employees on performance improvement priorities at the emergency department, the area of communication was considered as the most important area, which suggests the priority of this area in performance improvement of the emergency department. According to Kalisch and Lee (2010) (18), effective communication among staff is the main component of effectiveness at the emergency department and is directly related to improved performance of the department and patient’s satisfaction. Woloshynowych et al. (2007) (19) found that communication errors are the leading cause of patients’ death in hospitals. In reviewing the comments of medical staff of emergency department on performance improvement priorities, nurses had different attitudes towards performance improvement priorities, which are caused by the presence of nurses by the patients’ bedside and facing problems of the department and patients. Priorities of communication area were recognized as the most important priorities from the perspective of doctors and nurses at the department. O'Leary et al. (2010) (14) found that the relationship between doctors and nurses in safe and effective care is very important and poor communication between staff in the hospital is the largest cause of preventable side effects. Cameron et al. (2010) (20) showed that poor communication between hospital staff could cause 91% of medical events in hospitals. Also, opinions of doctors and nurses in the field of performance improvement priorities in the area of clinical pathways were significantly different. According to Jabbour et al. (2013) (21), clinical pathways were a contributing factor in improving health care quality and improving patient outcomes, reducing hospitalization time and health care costs. Therefore, workshops, posters and pictures to learn the clinical path at the emergency department, can improve performance of the hospital. According to the findings in the field of communication, the highest priority is sufficient knowledge of the physical environment of the emergency department by the staff. Zajano et al. (2014) (15) reported that physical environment of the emergency department and staff’s compatibility with this environment is important and Ajeigbe et al. (2013) (22) also noted that the information required to perform daily activities; care and treatment of patients should be available to emergency workers. Carbo et al. (2011) (23) found that emergency department staff should have sufficient knowledge of the physical environment to carry out daily activities and continually evaluate the environment in terms of critical information about the patient. Fatigue, distraction and misinterpretation of communication symptoms and signs are other priorities of the communication area. According to Leaver et al. (2009) (2), lack of proper communication, different communication styles, distraction, fatigue and misinterpretation of communication symptoms are the most important barriers to proper communication among hospital staff that should be considered. Simmons et al. (2015) (24) found that dialogue and discussion on ways to prevent injury to patients, is one of the most important priorities that should be considered at the emergency department. Strong incentive for teamwork in staff is one of the most important priorities in the area of teamwork. Hwang and Ahn (2015) (16) reported that strong motivation to communicate and teamwork among staff of the emergency department for care and treatment of patients is very important and can play a significant role in improving employee’s performance. Kocher et al. (2011) (8) found that sufficient number of emergency workers is one of the other priorities of the teamwork area. To improve the performance of the emergency department, a sufficient number of employees are essential for teamwork, and division and allocation of tasks must be done carefully and thoughtfully, otherwise, disagreement among employees can affect the performance and reduce the effectiveness of the treatment practices. Leaver et al. (2009) (2) reported that health policies and interventions to improve the emergency department performance require skilled manpower and sufficient financial resources. Zajano et al. (2014) (15) also reported that emergency department staff should try to have group interaction by determining the role of each of their colleagues, and at the same time, the head of the department should consider monitoring the performance of members and in the case of a conflict, he/she should solve it as soon as possible. In the area of clinical pathway, reducing the interval between arrival, admission and transfer of the patient at the emergency department has high priority. Chin et al. (2002) (25) found that time between arrival and admission, waiting time and the first clinical examination of the patient at the emergency department was one of the most important issues in a conducted research. Leaver et al. (2009) (2) also reported that due to increased patient waiting time at the emergency department, programs called emergency department improvement programs have been designed to reduce waiting times, improve clinical path and increase the satisfaction level of hospitalized patients. According to Chin et al. (2002) (25), admission, discharge or transfer of patients from the emergency department to other departments should be done during four hours. The proper conduction of triage and deciding on the admission and treatment are the other priorities of this area. Jabbour et al. (2013) (3) found that strict observance of triage steps improves the emergency department performance and any negligence in strict implementation of triage can cause irreparable damages to the patient. Jones et al. (2012) (1) also reported that although, much time is not exceeded after triage in hospitals worldwide, yet still fundamental changes in the triage of emergency patients around the world appears to be necessary. In the area of patient flow, one of the most important priorities was a suitable place for the rest of staff, which according to Chan et al. (2014) (12), shows the importance of space and place for the rest of the emergency workers. The use of trained and experienced staff at the emergency department is another priority of this area. The presence of experienced and trained doctors and nurses can be considered as a factor in improving the performance of the emergency department. Training courses for these staff enhance their skills and position in the care of patients. In investigation of other priorities at the emergency department, trust and confidence of the patient on doctors and nurses and polite behavior of emergency department staff towards patients are the most important priorities to improve the performance of the emergency departments, which according to Mercer et al. (2014) (4) can increase patient’s satisfaction. Reducing waiting time and its impact on the treatment cost is another priority at the emergency department. Melon et al. (2013) (26) found that increased patient waiting time at this department has affected treatment costs, and by designing appropriate strategies, patients’ waiting time at the emergency department can be reduced. Sufficient knowledge on the physical environment of the emergency department, strong motivation for teamwork among employees, reduced time interval between entry, reception and transfer of patients, and also, a suitable place to relax by staff with long-serving and faster transfer of patients to other hospital departments, are considered as the most important priorities for performance improvement in hospital emergency departments. This study was part of a PhD dissertation, which was supported by Science and Research branch of Islamic Azad University, Tehran, Iran.